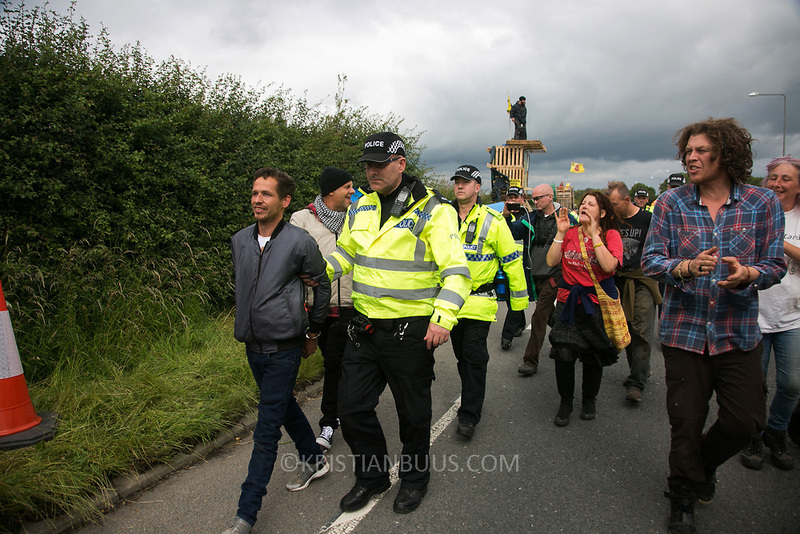 Anti-fracking activists and protesters outside the gates of Quadrilla's fracking site June 31st, Lancashire, United Kingdom. An activist is arrested for jumping on a truck bringing equipment after he handed himself over. The struggle against fracking in Lancashire has been going on for years. The fracking company Quadrilla is finally ready to bring in a drill tower to start drilling and anti-frackinhg activists are waiting in front of the gates to block the equipment getting in. Fracking is a destructive and potential dangerous and highly contentious method of extracting gas and this site will be the first of many in the United Kingdom reaching miles out under ground.